If you ever consider taking up a new sport or starting a new hobby, how do you know you’re on the right track? Where do you gain inspiration from? You stand on the shoulders of giants and learn from the best. The best of the best must have probably done something right to get the kind of success that makes them famous. Although figuring out who’s the best is subjective in most fields, when it comes to money and investments, there’s a pretty simple answer – the richest. The wealthiest, most successful business leaders either have a knack for investing money wisely or hiring the right people to do it for them. There’s no better investor than Warren Buffet and we frequently cite him on this blog. But Buffett isn’t the richest man on the planet anymore. That title goes to the humble and brainy Bill Gates of Microsoft. Now, most people wrongly assume the bulk of Bill’s wealth comes from the tech giant he helped create. In fact, Only 13% of Bill’s net worth come from Microsoft stock. He owns little less than 2.5% of the $560 billion multinational. That means the rest of his wealth, nearly $75 billion, is invested elsewhere. Bill Gates is worth an estimated $89.5 billion as of this writing. There is reason to believe he may well become the world’s first trillionaire if he lives long enough. The rest of it is invested in a surprisingly concentrated portfolio of the best dividend stocks (with one notable exception). As of December, 2016, regulatory filings show Gates held 16 different stocks in the portfolio. The biggest holding is a company you’ve probably heard of – Berkshire Hathaway. In fact, Gates holds $11 billion in Berkshire stock. It’s important to note that Gates doesn’t manage this portfolio himself. Instead. He’s trusted Michael Larson to handle the portfolio since 1994. Larson is the chief investment officer for The Gates Foundation and Bill Gates’ fortune, through the Cascade Investment fund. Little is known about Larson and that seems intentional. He’s a money manager with a degree in economics and an MBA from the University of Chicago. He picked the name Cascade because it was generic enough to fly under the radar. He’s also managed to not give any interviews since 1999. He’s probably the least known and most successful money manager on the planet. Before we get into the best dividend stocks Gates owns as part of his portfolio, it’s worth mentioning the outsized impact one particular company has on his foundation’s wealth – Berkshire Hathaway. Bill is close friends with Warren Buffett, and he’s convinced Buffett to part with Berkshire shares as part of the Giving Pledge. The Foundation now owns nearly 3% of one of the biggest companies on the planet. Berkshire makes up nearly 60% of Gates’ net worth when you consider the current market value of the shares. As everyone knows, Berkshire doesn’t pay a dividend. Buffett is convinced he can put the money to better use within the company and has never returned cash to shareholders via a dividend. Alongside the five stocks that do not pay a dividend, nearly two-thirds of the portfolio isn’t based on dividends. Calling Gates’ portfolio a dividend portfolio would be unfair. The highest dividend yielding stock in the portfolio probably reveals a lot about Larson’s investment strategy. 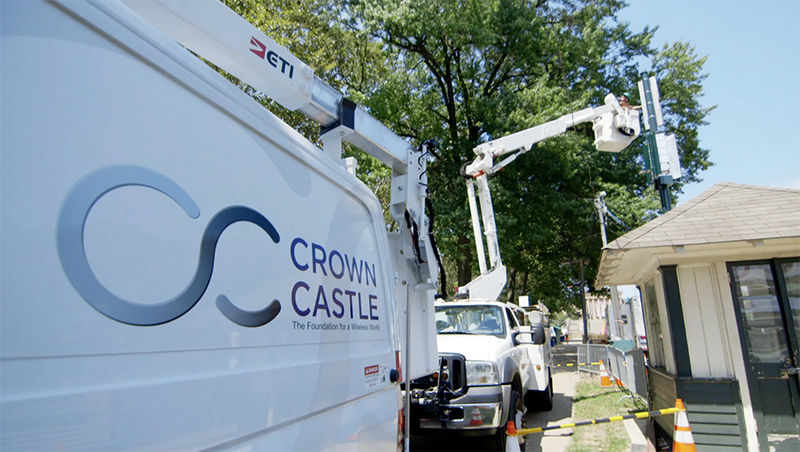 CCI owns and operates wireless and telecommunications infrastructure across America. They manage close to 40,000 towers and 16,500 miles of fiber optic cables. The big three telecom companies in the US are the company’s biggest customers and there is tremendous visibility in long-term revenues. This makes it a predictable, stable, and highly lucrative dividend stock. It’s basically a niche REIT. The world’s largest parcel delivery and logistics company has a competitive edge that’s stunningly durable. The value in UPS is in the network and global supply chain they’ve created over the past century. Last year, the company sent out over 4.9 billion packages and documents to more than 220 different countries. This is stable and predictable income that’s likely to be boosted by international trade and e-commerce. Recreating such scale and volume is nearly impossible for competitors. That advantage has helped the company grow annual dividends 8% to 9% every year for the past decade. CAT is as American as it gets. The company manufactures its mining and construction machines in the US and sends it out across the globe. More than 60% of revenues come from outside the US and through a network of 175 loyal dealerships. The company has been paying a dividend every quarter since 1933. It’s well on its way to joining the Dividend Aristocrats Index in 2022. It’s already part of the High-Yield Dividend Aristocrats Index ( a more aggressive version of the same index). Larson seems to be holding onto the massive Wal-Mart stake despite Berkshire cutting it this year. Buffett believes Amazon has cut into the retail space too drastically and cut his stake by nearly 90% in this quarter. The single-digit growth and intense price competition from Amazon could be a reason for concern, but Larson doesn’t seem to think so. WMT is still 4.4% of the overall portfolio. Perhaps the biggest player in the waste management industry, WM owns landfills and the sort of properties that are difficult to replicate. Long-term and stable waste management contracts with offices and residential areas mean the cash keep flowing in. Collecting trash is, as you would expect, a recession-proof business. This has helped the company grow dividends every year for the past fourteen years. Coca-Cola FEMSA is Coca Cola’s bottling partner. FEMSA, a Mexican beverage company, owns 48%, Coca Cola owns 28%, and the rest is split between the stock exchanges in Mexico and US. The advantage with this company is the relative exposure to Latin America, where bottled water and soda are sold in tremendous volume. Bottling operations have been creating stable earnings for the past 20-odd years. A lot of this accrues in the form of dividends to the Gates portfolio. A quick look over the rest of the Gates portfolio makes the strategy clear. This is a long-term, buy-and-hold strategy applied to a portfolio with the best dividend stocks. I’ve always considered Berkshire Hathaway a bellwether for the American economy. Most of Berkshire’s business and revenues are based in America. Buffett himself is a permabull on American enterprise and the economy. Combined with Wal-mart, CAT, and Walgreens, you can view the portfolio as a optimistic bet on the future of the United States. Digging deeper, you’ll notice most of the stocks are in easy-to-understand, consumer goods companies. There’s retailers, beverage companies, and media outlets. There’s a lot of focus on emerging markets, especially in Latin America. While Grupo Televisa is a Mexican multimedia giant, Coca-cola FEMSA and Arcos Dorados (ARCO) are LatAm-based subsidiaries or partnerships of well-known American brands like Coke and McDonald’s. The way these stocks are picked up and held for years displays a very typical value-oriented strategy. These companies have tons of free cash flow, which are easier to predict, and more mostly distributed out in the form of dividends. The business models are built around sustainable competitive advantages such as long-term contracts, deeply entrenched business networks, and unique properties. The money manager buys when there’s a reasonable difference between the intrinsic value and the market value of the shares. There’s a focus on the margin-of-safety and the long-term earnings potential. Being the richest man in the world is not easy. However, preserving and growing wealth at the clip Bill Gates has managed over the years is outright astounding. I think much of the credit here goes to two wise money managers who are closely associated with Gates – Warren Buffett and Michael Larson. As long as Larson and Buffett keep picking the best dividend stocks and excellent value companies, the Gates fortune will continue to expand. Gates might soon become the world’s first trillionaire. Estimates suggest that he simply needs to live to 86 for this to happen. Considering he’s giving away the bulk of his wealth and is already spending much of it helping those in need, I think this is great news for everyone. For the income-seeking, dividend investors on this blog, there’s a lot to learn from Gates’ private portfolio. There’s a lesson in diversification. Although he only holds 16 different companies, each one of them is in a unique industry. Microsoft contributes less than 15% of his total wealth. Berkshire contributes 65%, but that’s a well-diversified conglomerate. The lesson here is to diversify, but not too much. Focus on quality and stick to companies that are easy to understand. Predictability is lot more important than potential. If you can confidently predict how much the company will likely earn over the next few years, it’s a safer bet. Of course, look for companies that pay a high quality and sustainable dividend.